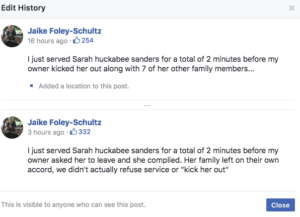 A man claiming to be a waiter at the Red Hen restaurant in Lexington, Virginia, posted on Facebook Friday that the owner refused to serve White House press secretary Sarah Sanders and her family, resulting in an online battle between supporters and people who called out the discrimination. Jaike Foley-Schultz had previously posted about the incident on Facebook, then changed his version of events. Sanders’ Twitter post clearly aligns with Foley-Schultz’s original post. Later that evening, Brennan Gilmore, the executive director of Clean Virginia, reposted the story on his Twitter page, which attracted more than 15,000 likes and 4,000 retweets. 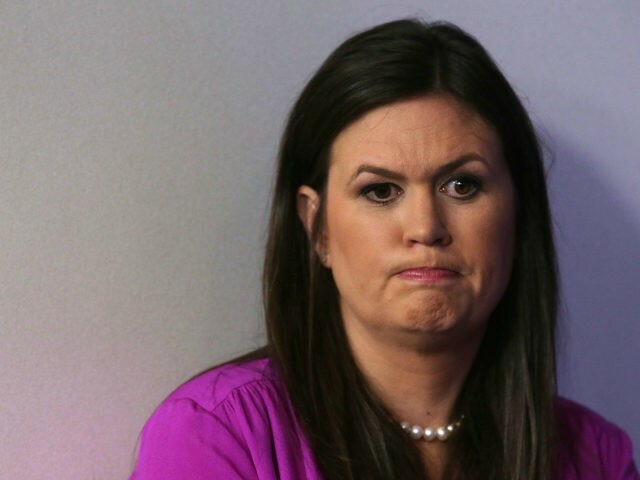 “@PressSec got kicked out of the Red Hen restaurant in Lexington, Va tonight. Apparently the owner didn’t want to serve her and her party out of moral conviction,” he wrote. “Cant wait to visit this establishment when I pass thru in July. From what I hear they have great food standards morals and respect for human decency. This is my type of place,” Mashay Clart wrote. Not all of the people weighing in, however, supported what they saw as blatant discrimination. 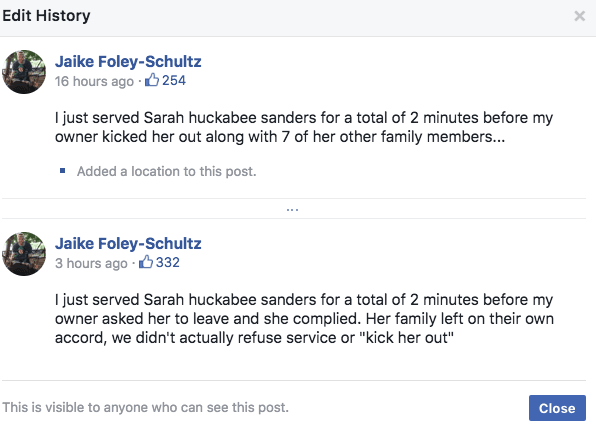 “I saw the owner refuse Sarah Huckabee Sanders service because he is a Democrat and can’t be a decent human being, What an idiot,” Solomon Sanchez wrote. “Rude, bigoted, hateful staff and owners. What a disappointment,” Valarie Waskom wrote.